Goo Goo Dolls are set to release their new album, Magnetic, on May 3. The first single from the record, Rebel Beat, is already making waves ahead of the upcoming release from the multi-platinum, Grammy-nominated band. Singer-guitarist John Rzeznik, bassist Robby Takac and drummer Mike Malinin recorded in New York, London and LA with Gregg Wattenberg (Train), Rob Cavallo (Green Day), John Shanks (Bon Jovi), and Greg Wells (Katy Perry). Magnetic is the tenth studio release from the Buffalo, NY trio. “I'm so proud of our new album…I've had such a great time and learned so much from the amazingly talented people who worked on it with me,” says Rzeznik . "I think that positive energy comes across on the songs. Writing and recording Magnetic changed my thinking about making music and doing it in a fun way,” he explains. Goo Goo Dolls have sold over 10 million albums worldwide. They are the only artist to have three songs on Billboard’s Top 100 Songs from 1992-2012, including #1 for Iris. Rzeznik has been honored with the Songwriters Hall of Fame Hal David Starlight Award and they have shared the stage with everyone from The Rolling Stones to Taylor Swift, who recently covered Iris with Rzeznik onstage. 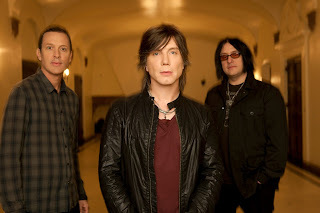 Most recently, Goo Goo Dolls honoured President Barack Obama in Washington, DC.